Need a last minute costume? On a budget? No sewing skills? Don’t worry. 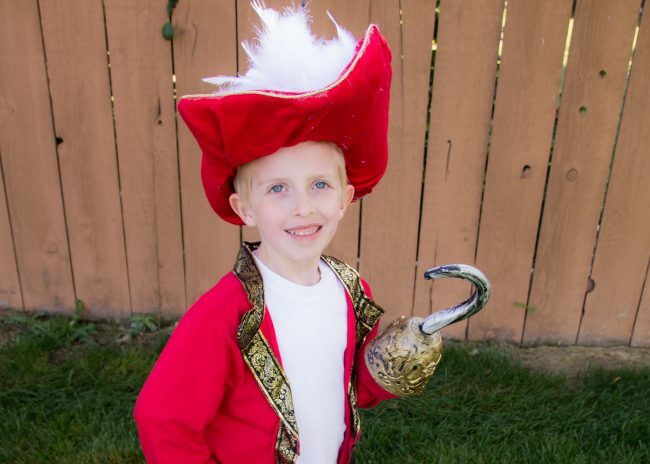 This DIY Captain Hook Costume is super easy and you don’t have to do any sewing! Check out the tutorial below. I am loving making my kids’ Halloween costumes this year. 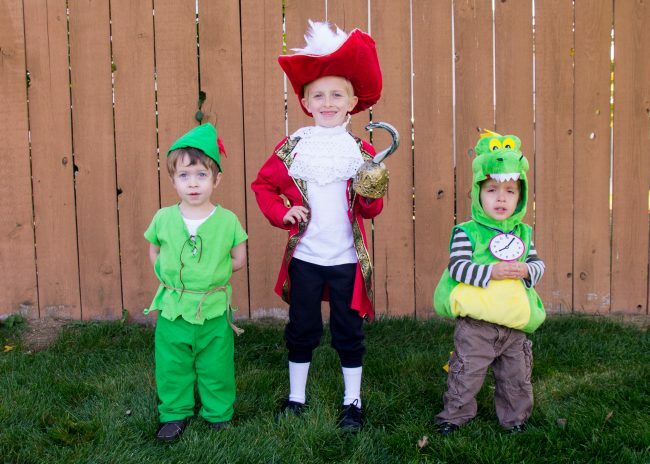 If you have been following this blog for a while, you probably know we do family costumes. I am sure I only have a year or two left before my oldest ruins this no longer agrees to this so I am milking it for all it is worth. 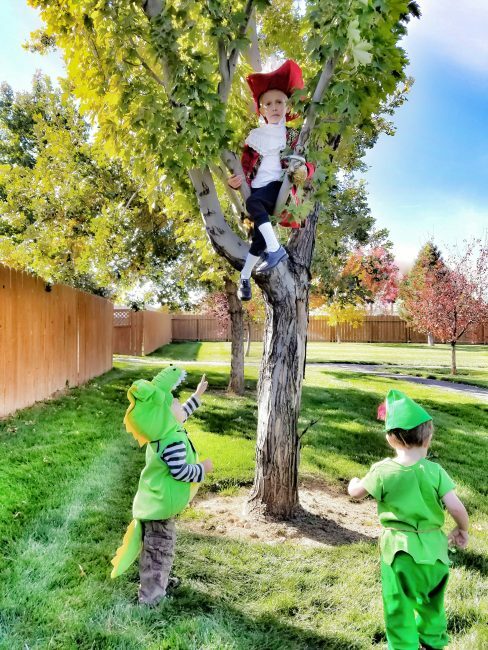 If you hadn’t guessed from my post last week, this year we are doing a Peter Pan theme. 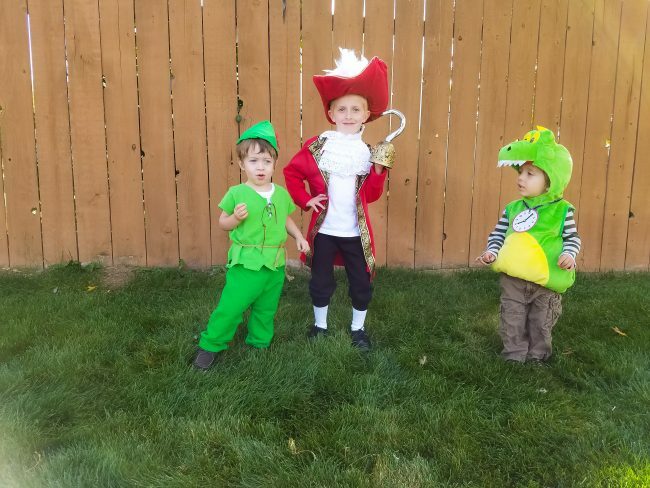 While I did not make the Crocodile costume, I did make costumes for my other two (and will probably make a green pair of pants for the Crocodile costume). 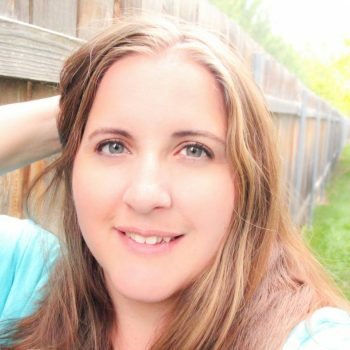 The best thing about the costume I made…both are super simple and have no-sew options! 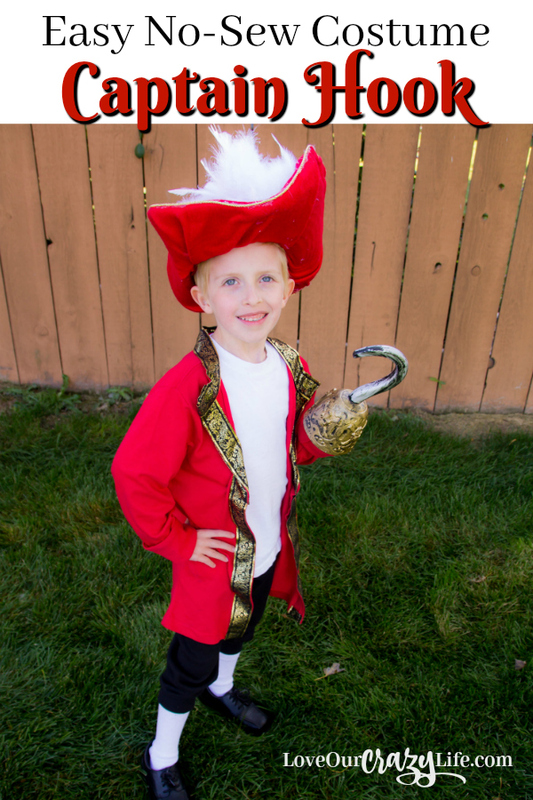 Today I am going to share how to make a no-sew Captain Hook costume. You will be shocked at how easy it is. This is great for a last minute costume. To start, simply cut a line straight up the front middle of your long sleeve shirt. Keep it as straight as possible. Then use fabric glue to attach ribbon all the way up each side, and then back down the inside 1/3 of the way down. If you have ribbon that frays, be sure to tuck the edges under creating a “hem” of sorts. 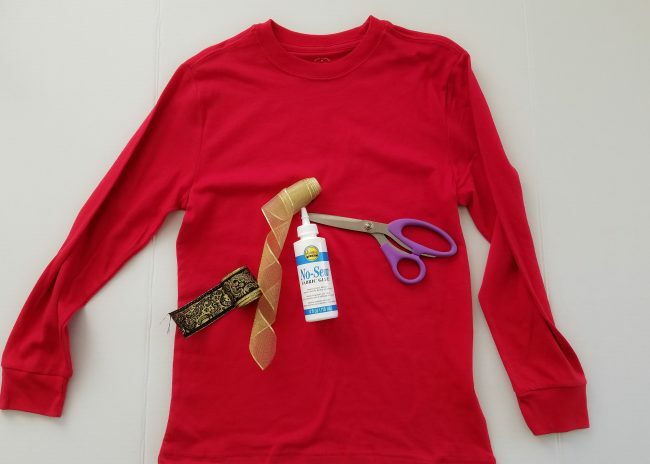 After you run ribbon on both sides, create a collar by folding the top over and using fabric glue to hold it down. If you want, you can then run ribbon around the back and attach it with fabric glue as well. That is it. You are done with the jacket! What is a captain without his hat? 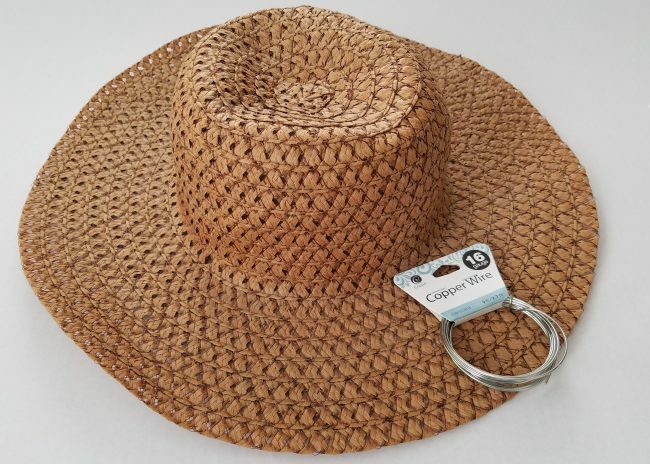 My moms had a straw hat that she gave us to make the hat out of. Her hat was soft and bendable, but if you have a stiff straw hat, soak it in water for 12 hours to help it soften before working with it. If you look at Captain Hook’s hat, one side of the brim is much taller than the other. In order to achieve this look I used some wire to extend the brim on side. 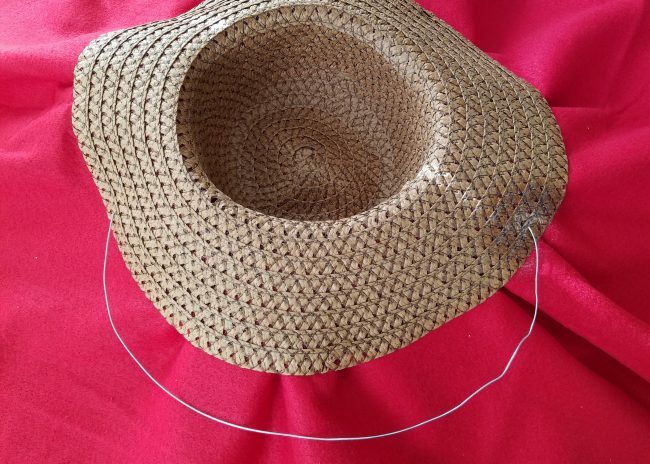 Measure how much wire you need and use your hot glue gun to attach it to the hat. It doesn’t have to be perfect, but kind of get it in a semi smooth shape. If you want to be able to better shape the other side of the brim, you can put some wire on there as well, but I found after covering in felt, mine was fine without it. 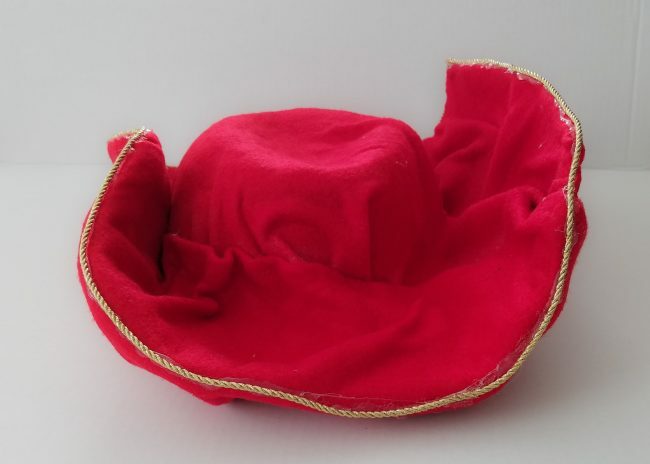 Next, cover the hat in your red felt/flannel using the spray adhesive. It doesn’t need to be perfect. Mine is very loosly wrapped on there, and several seams are visible, but you will hide those later. Definitely not perfect, but it all works out. Use the hot glue gun to attach some gold braided ribbon around the rim. Finally, I used hot glue to attach the feathers. 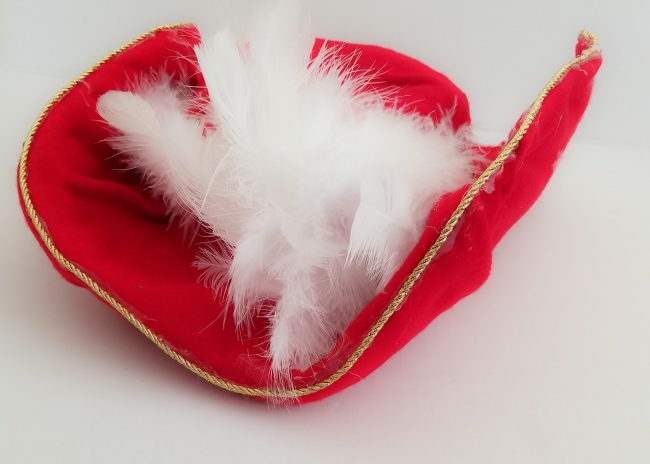 I used the feathers to help hide the seams on the front of the hat. You can buy a big huge feather if you can find one but I didn’t find one at the first two craft stores I went to so instead, I bought a bag of smaller ones, I used small white rubberbands to help gather them before gluing them on. 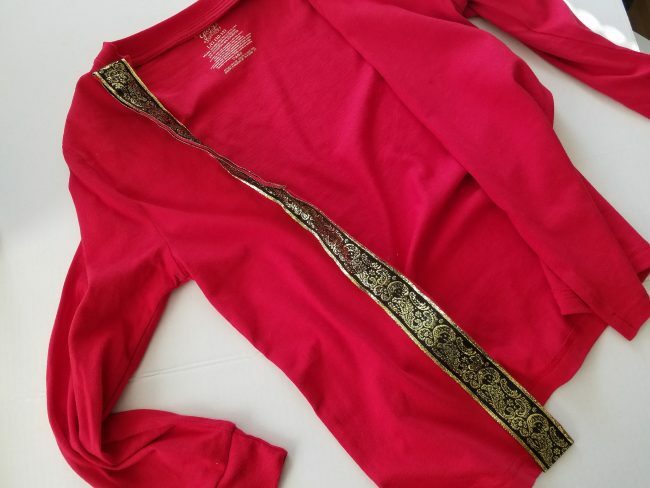 To complete the Captain Hook Costume I had my son wear a white shirt, black sweats that were a few sizes too small and had elastic at the bottom, long crew socks, and black dress shoes. I added on the hook from the dollar store. This costume is so simple but turned out so great! I love that both these costumes have no-sew options and are pretty affordable. 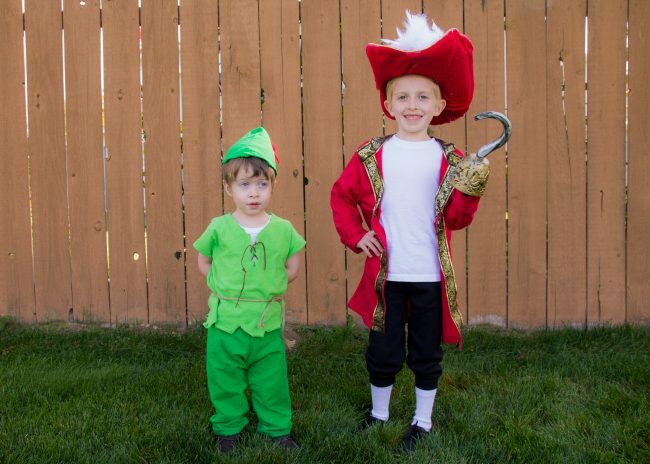 Be sure to check out the Peter Pan Costume Tutorial as well. Now, I did feel like the Goof’s costume was missing something, so I did go ahead and sew up a quick jabot or dickie (I am not sure which is the correct term). We had a lot of fun with this year’s costumes and we had to play around during our photos. So I love this one of Tick Tock Croc having Captain Hook hiding up a tree. Leave me a comment below letting me know what your family is dressing up as for Halloween.